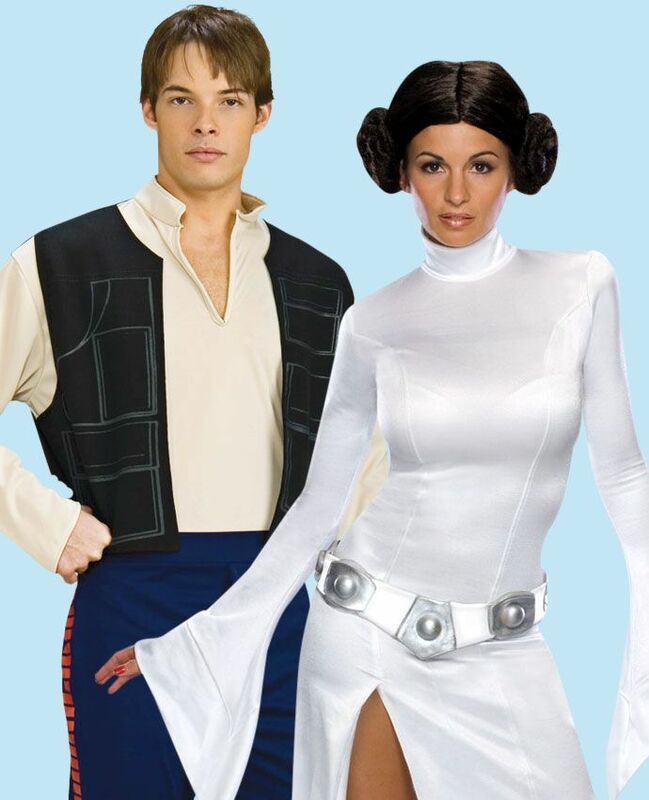 Looking for a great couple’s costume? You’re in the right place! Whether you’re off to a fancy dress party or celebrating Halloween, we’ve got a useful list of brilliant his and hers fancy dress ideas for you and your partner to try. Is there a more iconic Disney couple? 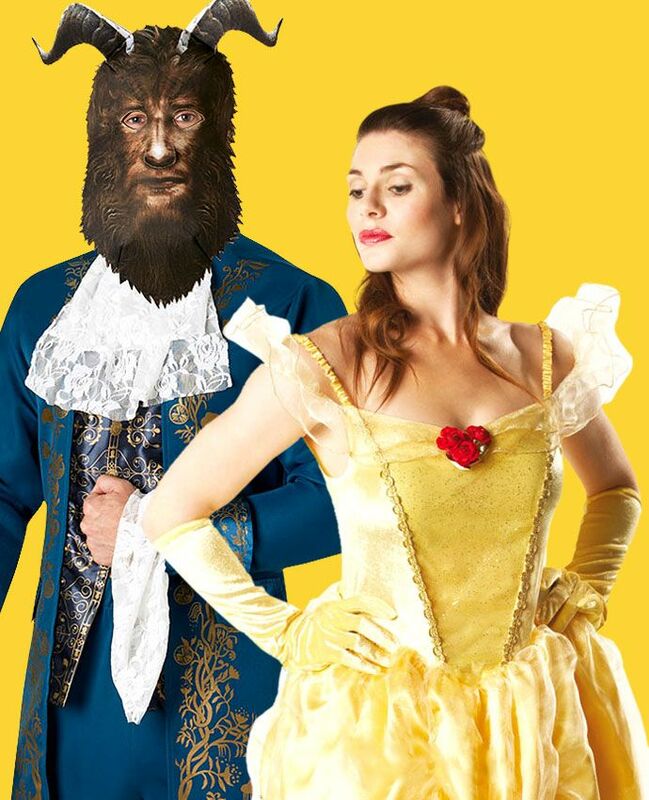 You’re never too old for Disney and you’ll definitely make a fairytale entrance dressed as Beauty and the Beast! 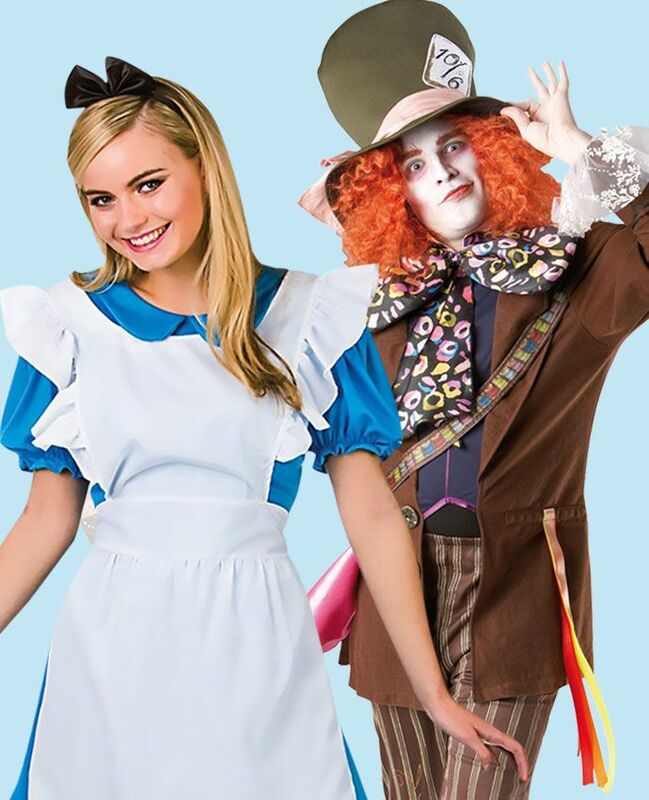 Dress your other half in this magnificent Beast outfit, then add a half-up, half-down hair do and red lipstick to this Belle costume to complete your transformation! Do you wanna build a snowman? 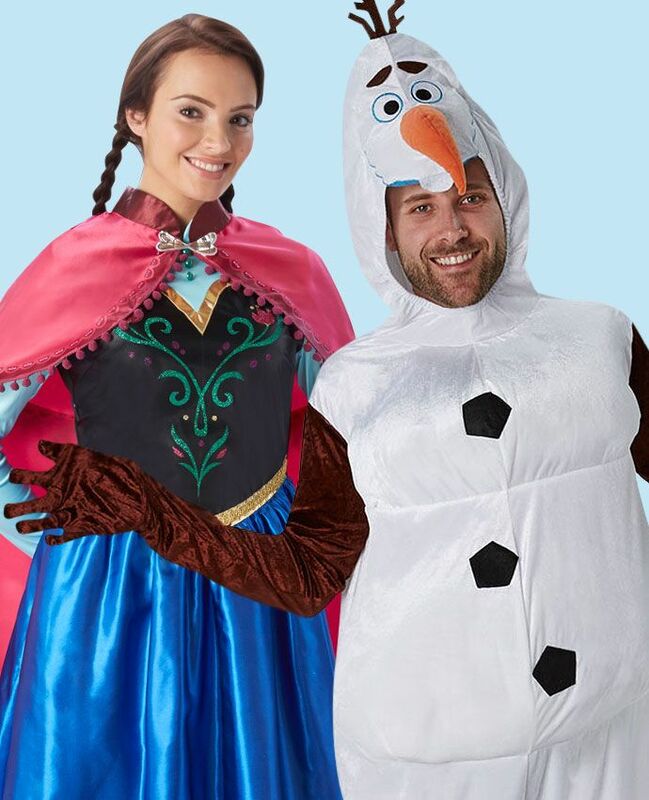 With this cheeky little Olaf costume, you won’t have to! Your man will have a great evening doing whatever snow does in summer (or having a few drinks, whichever works), while you get to look gorgeous in this lovely Anna princess dress. 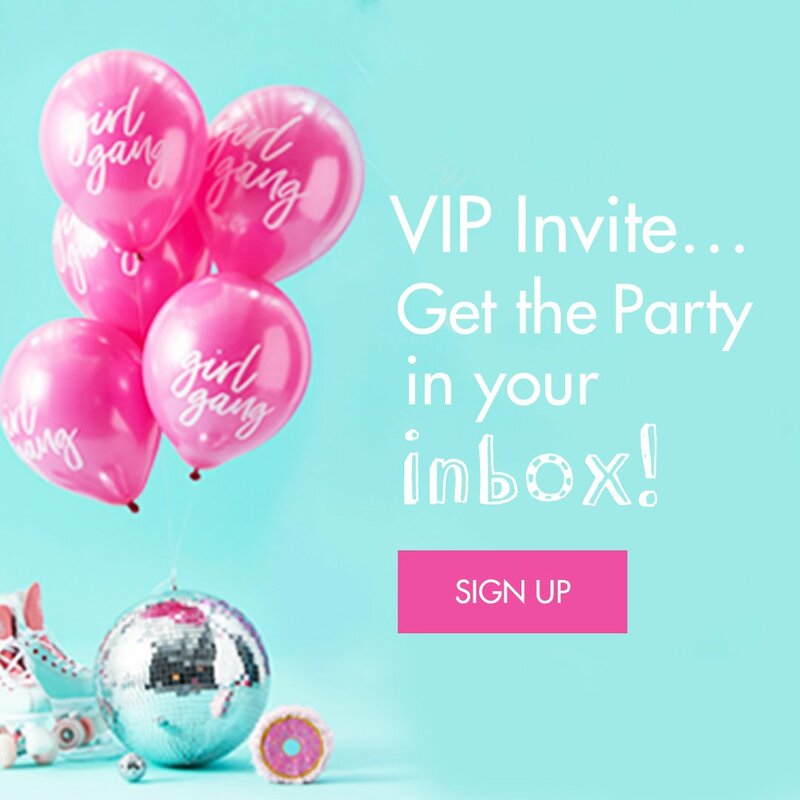 Frozen fever shows no sign of slowing down, so this is a theme your fellow guests will love! Looking for something straight out of a fairytale? It doesn’t get much better than Cinderella and Prince Charming! This is a great combination if you want to stay with a Disney theme, but you’re with a guy who’s not keen on wearing anything too silly. 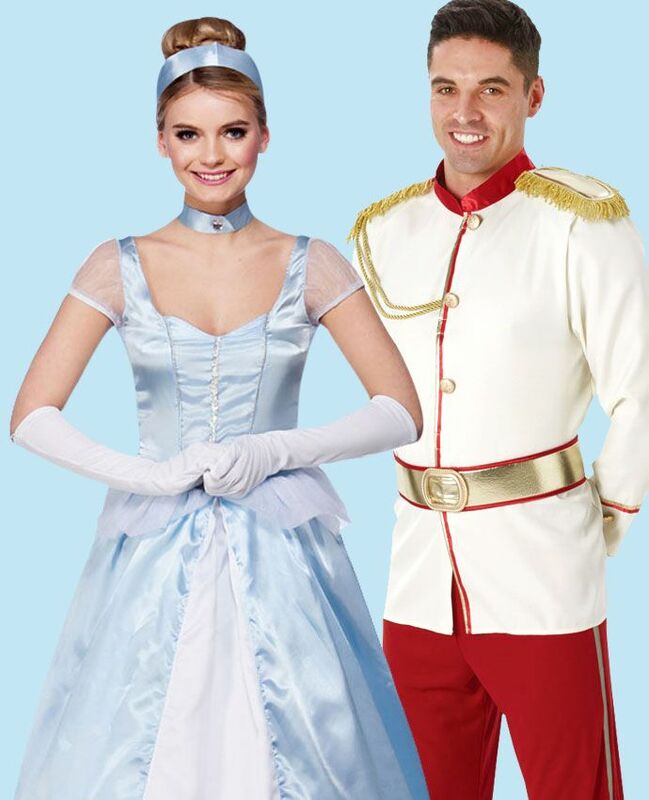 You’ll both look equally fabulous in this Cinderella ball gown and smart Prince Charming outfit. 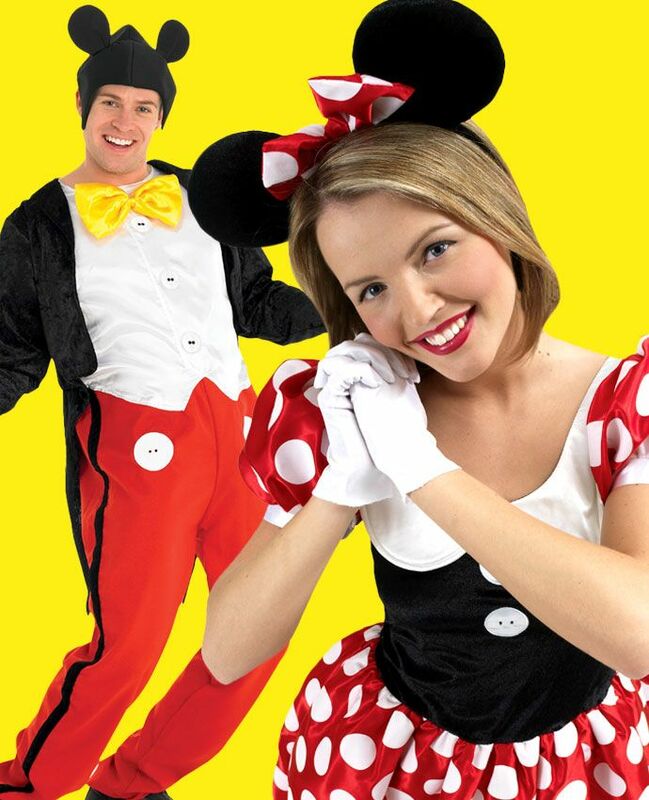 How about dressing up as the original Disney sweethearts – Mickey and Minnie Mouse? 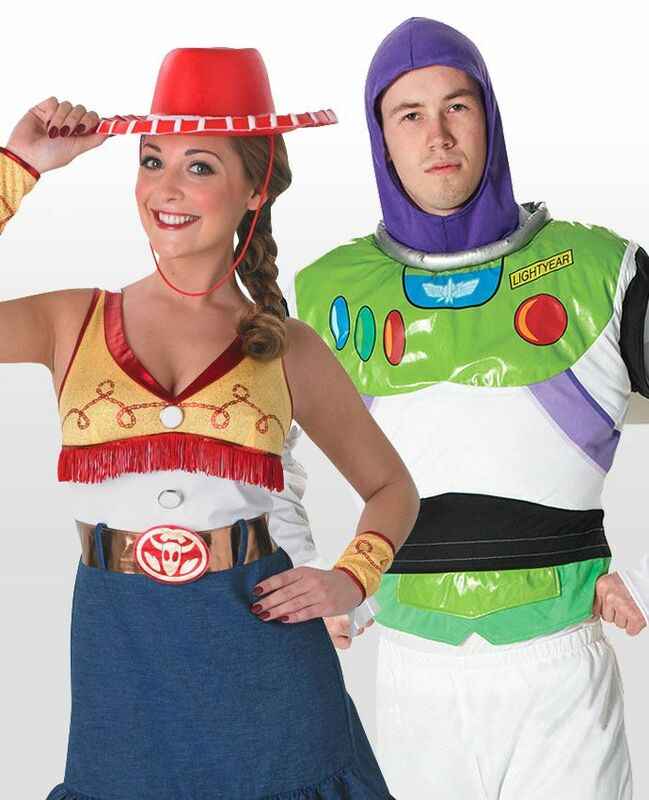 These are the perfect costumes to bring your favourite cartoon couple to life! 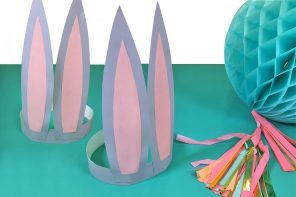 Whether you’re having a tea party or celebrating yet another un-birthday, Alice and the Mad Hatter are a great match for your fancy dress party. You get to look elegant in a lovely blue and white ensemble, plus you get to make loads of jokes about how ‘mad’ your other half is, and that’s lots of fun for everyone! 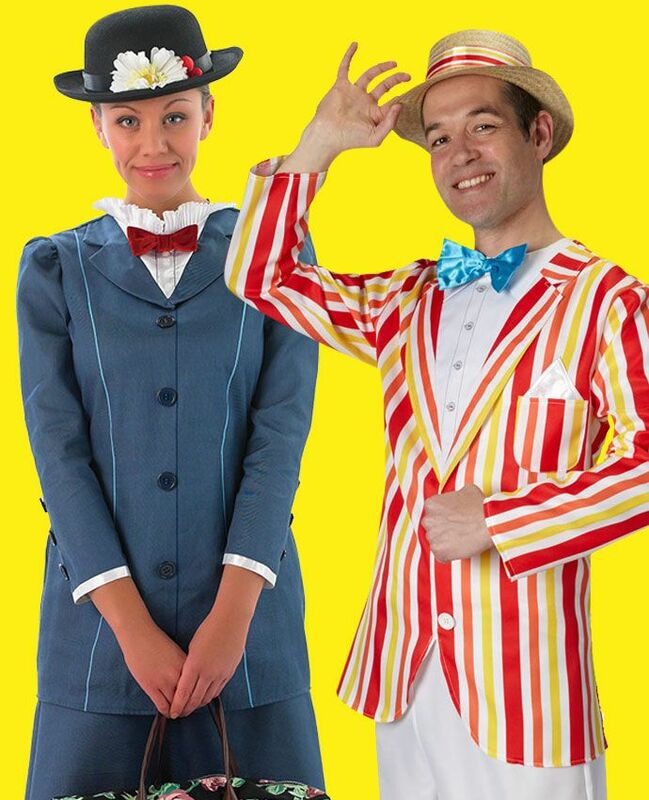 Let’s switch to a live action Disney couple for a minute and take a look at Mary Poppins and Bert! 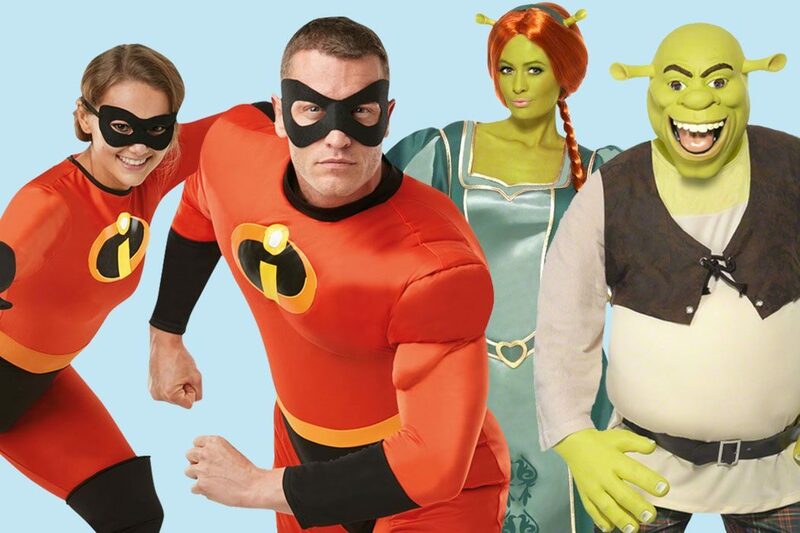 This authentic costume will transform you into the original supernanny, while the guys get to choose between Bert’s handsome ‘Jolly Holidays’ suit or his chimney sweep getup. It’s the classic ‘space ranger meets cowgirl’ story. The Toy Story films brought us lots of reasons to be cheerful, and the unlikely pairing of Buzz Lightyear and Jessie is just one of them! We’re not done with Toy Story just yet, either! 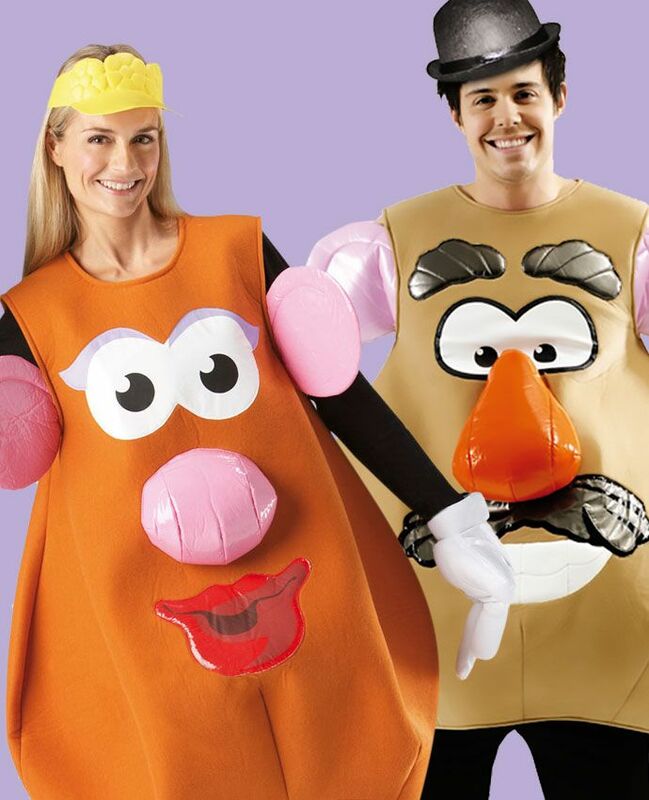 If you’re after something quirky that’s guaranteed to raise a smile, Mr and Mrs Potato Head is a real winner. 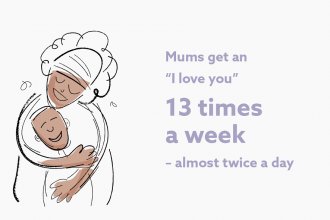 It’ll take you less than a minute to get ready, too! 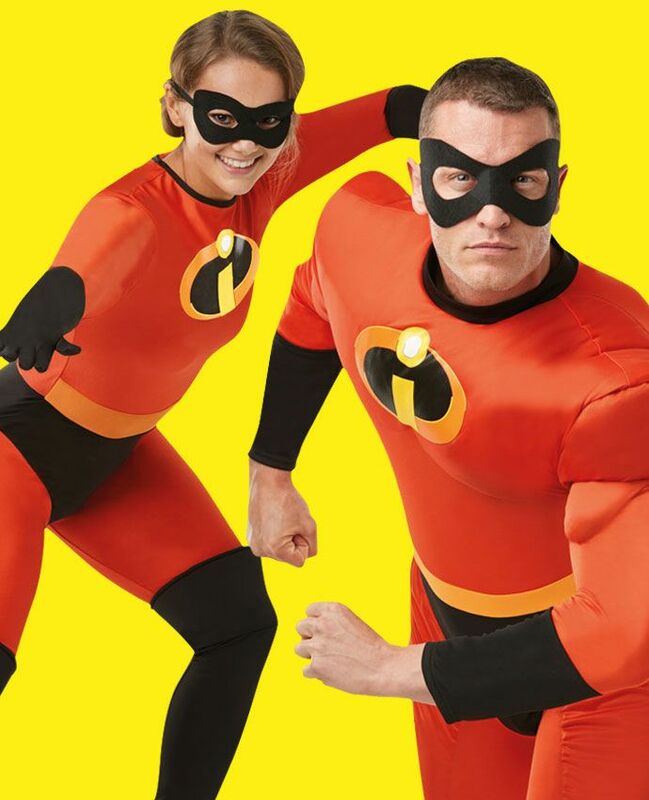 An ordinary married couple by day, world-saving superheroes by night, Mr Incredible and Elastigirl make the ultimate superhero costume for two! 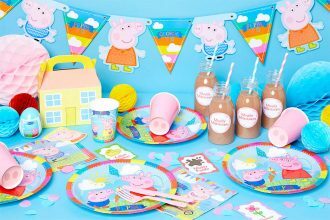 When you think of parties, you don’t usually think of swamps! 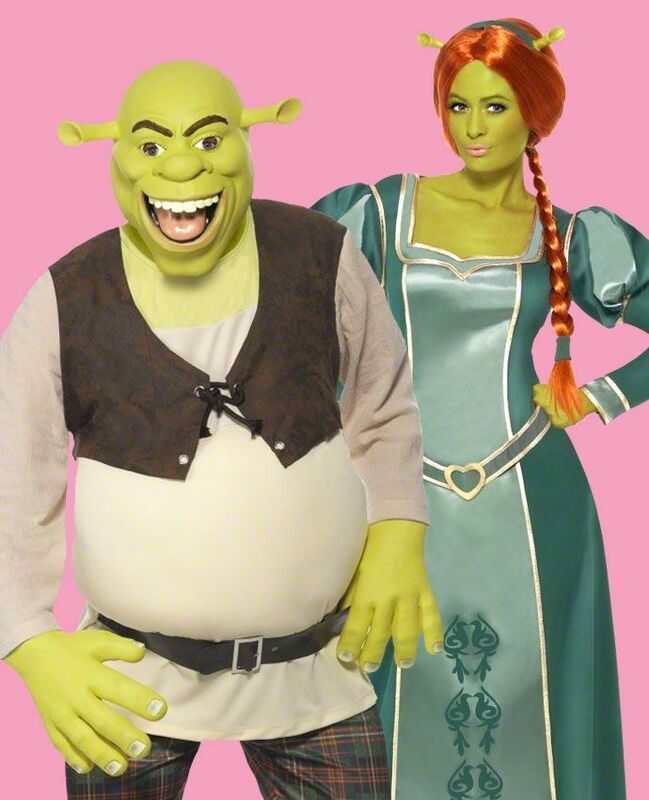 However, in this case it’s the place to go for your perfect couple’s fancy dress costume, with these Shrek and Princess Fiona outfits. Since 2016’s Suicide Squad, Harley Quinn has become one of the most popular women’s fancy dress costumes in the country! 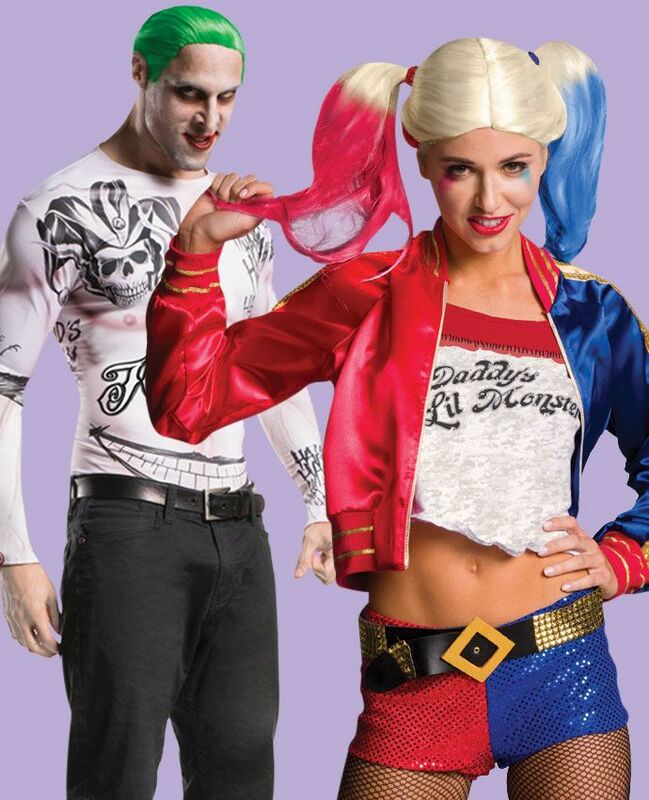 Jared Leto’s unique take on the Joker also makes for a very distinctive outfit, so this is a great fancy dress option for couples. Anyone who’s watched the Avengers films knows there’s always been a little something between Scarlett Johansson’s Black Widow and Mark Ruffalo’s Hulk. While we’re all obviously rooting for them to get together, you can make this pairing a reality right now with these marvellous fancy dress outfits. It’s one of the most famous lines in film, and it’s one of many reasons why Princess Leia and Han Solo will definitely feature on many people’s list of favourite cinema couples! These star-crossed Star Wars lovebirds are sure to earn plenty of approving nods from other party guests. 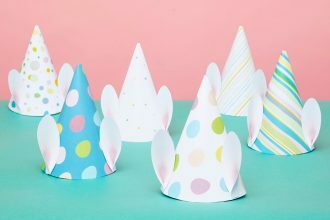 If trying to decide what to wear has left you and your partner feeling like you’re not in Kansas anymore, how about going for a Wizard of Oz theme? Dorothy and her old pal the Scarecrow are a great choice! 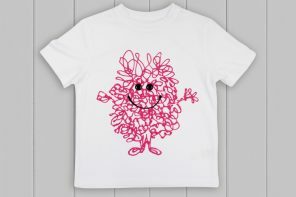 And, if your other half doesn’t fancy dressing up as a Scarecrow, how about a Tin Man instead? 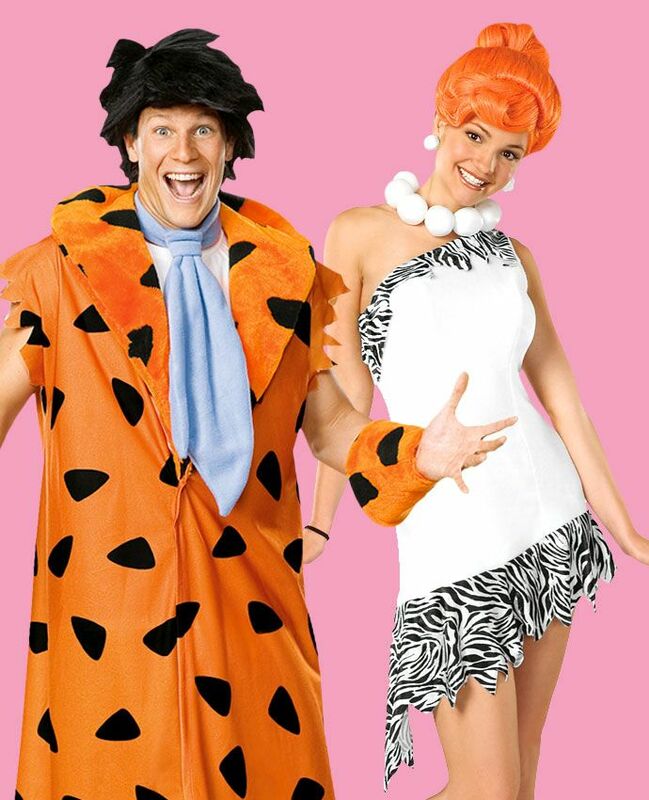 Take a trip back to the Stone Age and dress up as everyone’s favourite cartoon couple! It feels like Wilma and Fred have been around forever, so you’re sure to be one of the most recognisable couples at the party in these outfits. Yabadabadoo! 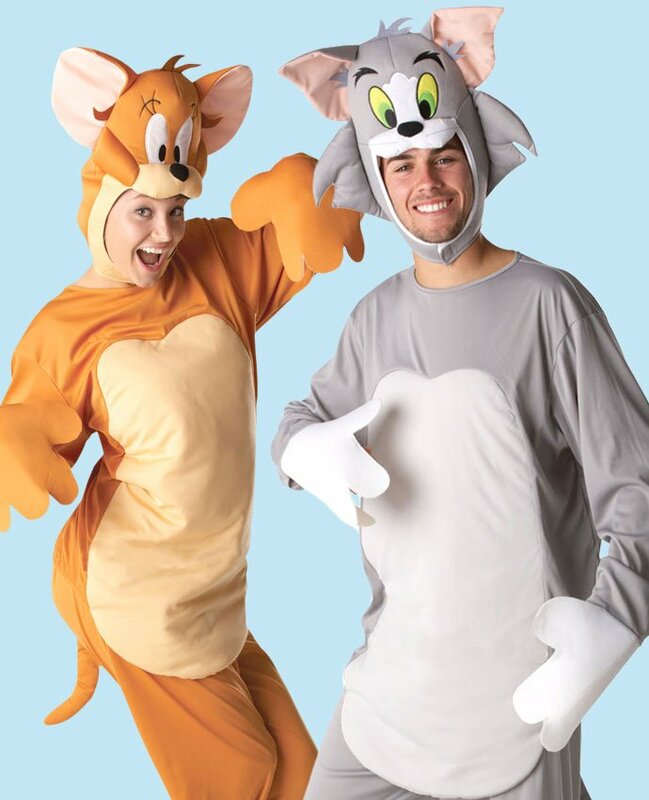 While we obviously hope your relationship is a little bit friendlier than this classic cartoon couple, Tom and Jerry do make a great pair of outfits for a fancy dress party! Both these comfy onesies are ideal for a man or woman to wear, so we’ll let you choose who’s who! 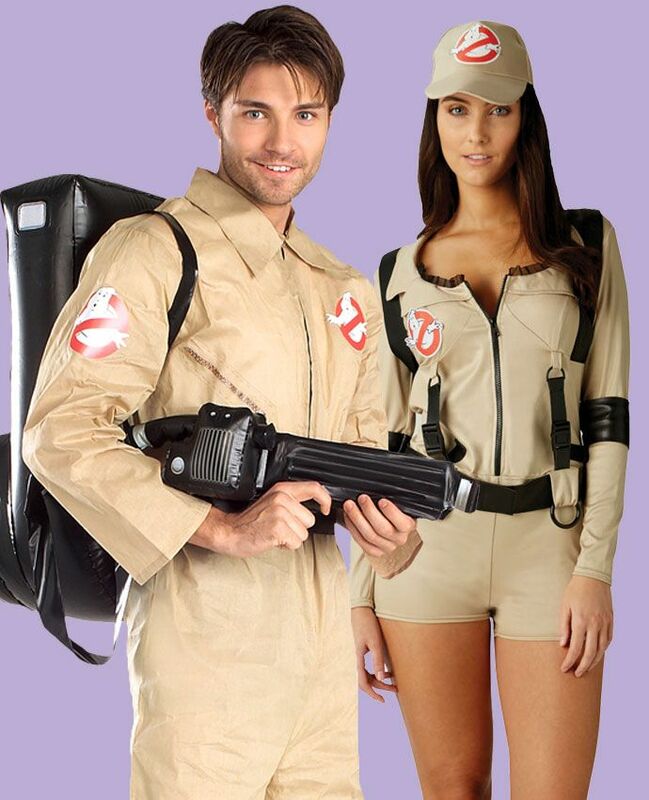 When you can’t decide what to wear tonight, who ya gonna call? The answer, of course, is the Ghostbusters! We’ve got plenty of costumes for both women and men, so get your proton packs on and prepare for an evening of spooky shenanigans! Love a good fry up? 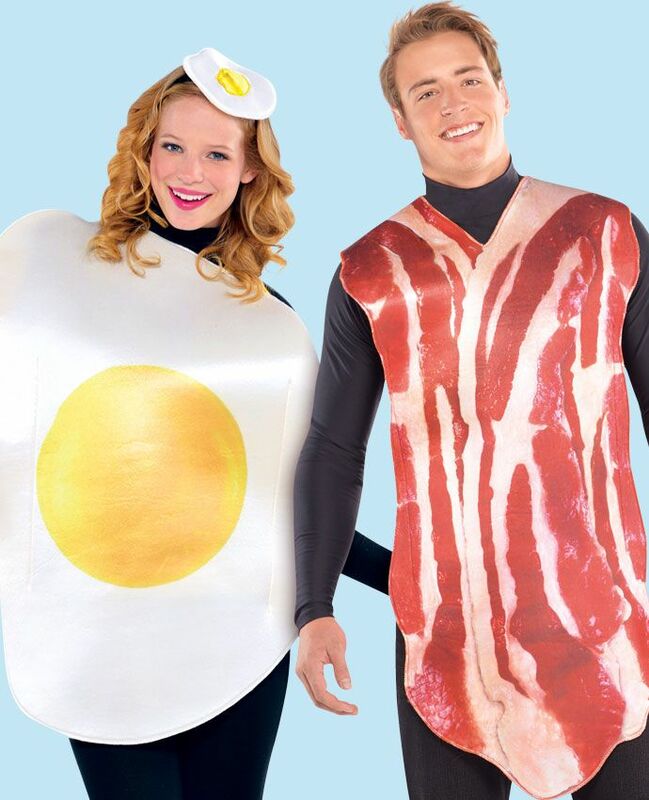 Why not dress up as bacon and eggs? This is an easy couple’s costume idea that’s got plenty of novelty value! Need a couple’s costume for Halloween? You can’t really do better than the Addams Family! Morticia and Gomez are the ultimate creepy couple, and both of these costumes are really fun to wear. Don’t pretend you’re not humming the theme tune right now, either! How about rocking up at the party as a pair of swashbuckling pirates? 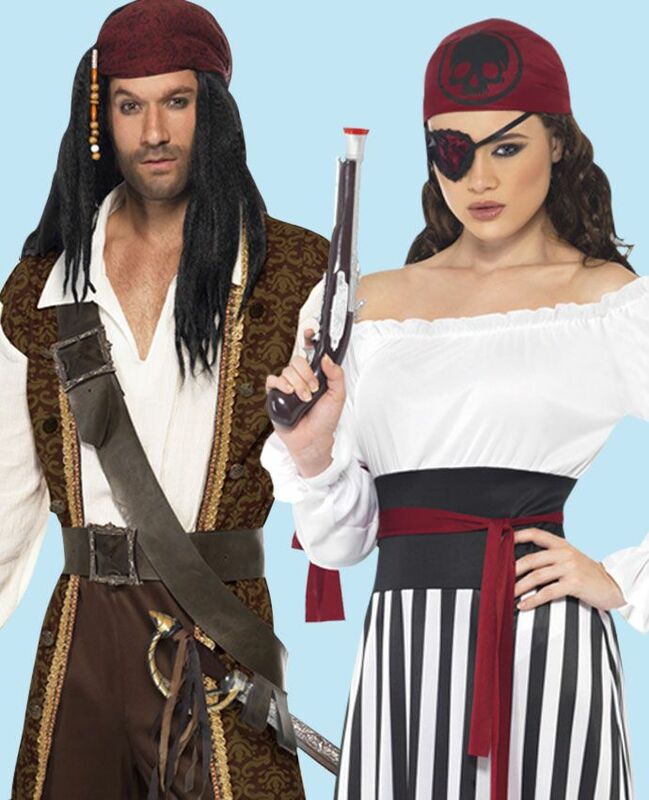 We’ve got plenty of pirate outfits to choose from for men and women, not to mention dozens of brilliant accessories! Clowns work for a range of party themes, from Halloween (see below) to circus. 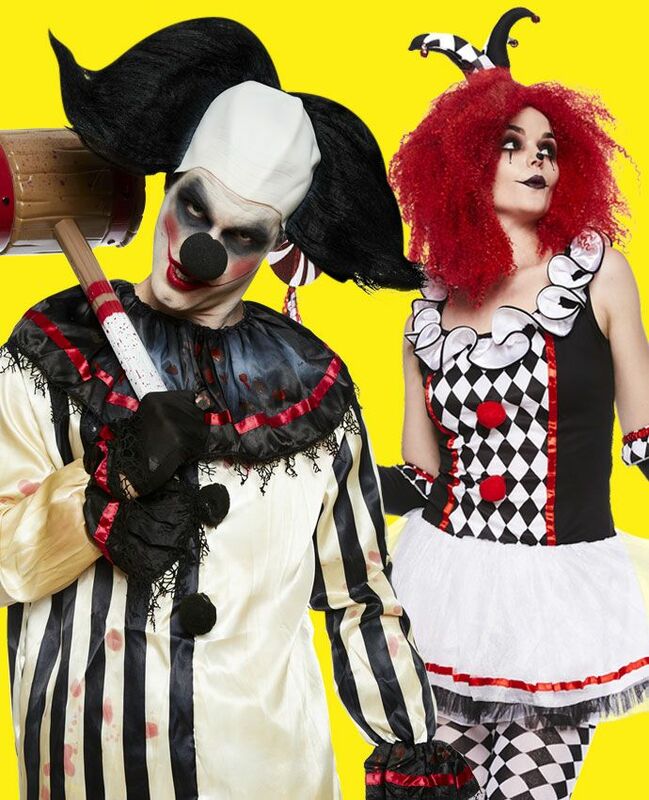 We’ve got plenty of clown costumes for you to choose from, and it’s up to you whether you go down the creepy route or search for something more family-friendly! 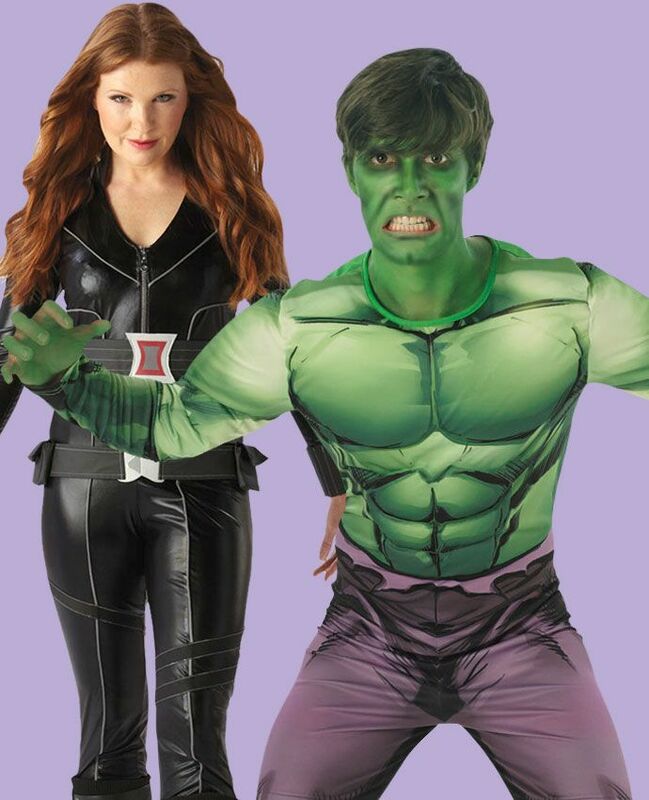 Have you bought one of these couples’ fancy dress costumes for your party? Or did you have your own idea? Share your photos with us on Instagram and we’ll show off the best!